Start with a push mower and a dream…. Mow Money is a game to determine which players has the best reputation for lawn mowing in the community. Contracts equal to the number of players will be placed out for bid each turn. Each player will be able to bid on 2 contracts or bid on 1 contract and choose to do an odd job for money. All bids use 3 types of bid cards: Basic, Medium, and Advanced. 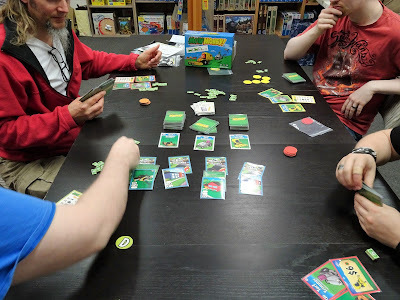 All players simultaneously and secretly place their bids including any odd job cards and the tile corresponding to the contract they are bidding on face down in their play area. All bids are then revealed. Any contracts receiving multiple bids is awarded to the player who placed the lowest bid. Contracts are the main source of victory points so competition will be fierce for lucrative contracts. For each contract receiving a bid, the player winning it collects the contract, victory points and the cash associated with it. Contract winners must then discard the bid cards they used to secure the contract while players who lost out on any contracts return their bid cards back to their hand. Anyone who played odd job cards receives cash. 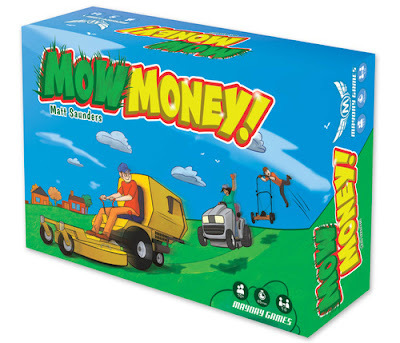 At the start of each round players may buy additional bid cards and/or upgraded lawn mowers. Bid cards must be bought with the lawnmower that corresponds to the bid cards. A basic Sod Snipper will only get you Basic bid cards valued from $1 to $3 while a Gas Guzzling mower in your fleet can get you Advanced bid cards valued from $3 to $5. Players start with a Basic Sod Snipper. Low end contracts can be won with a low end mower and low end bid cards. More lucrative contracts will require bids with a better mower and more advanced bid cards. The crux of the game is to figure out who is going to bid on which contracts. Do you bid high on low end contracts, win, and get lots of cash for a few points? If there are high end contracts available, how low do you need to bid to win that contract? Or, do you do a series of odd jobs to build cash for a big push in future rounds? There is lots of room for messing with the minds of your opponents. Each player even has 3 bluff cards to place in their respective bids to conceal what it is they are up to. The game ends when one bid card stock is exhausted. The player with the most points on the contracts they won will be the lawn mowing champion. We have an open copy of Mow Money available in our Demo Games Library for you come in and try.